First grind the cashewnuts to a very fine powder. Then boil the milk in a pan which has a thick bottom on very low flame till it reduces to half the quantity. Keep stirring in between so that the milk does not burn. Add sugar & stir continuously till the sugar dissolves completely & the milk thickens further. Add the powdered cashewnuts when the milk is nice & thick. Keep stirring the mixture continuously without allowing the mixture to stick at the bottom of the pan. When the mixture bubbles at the edges of the pan, it is almost ready. Test the mixture in a bowl of water if it is ready to turn out. The mix should hold together & not separate & dissolve in the water. Add some butter & reserve some to butter the moulds. Stir again till the mixture holds together but separates a little & you can see the bottom of the pan while stirring with the spoon. Turn the mixture on a plate & let it cool thoroughly. When completely cool, then butter the rubber mould & mould the milk cream. Place them on a tray & let it dry overnight. Dear Hilda, Thanks for this wonderful recipe I am anxious to try this one out. 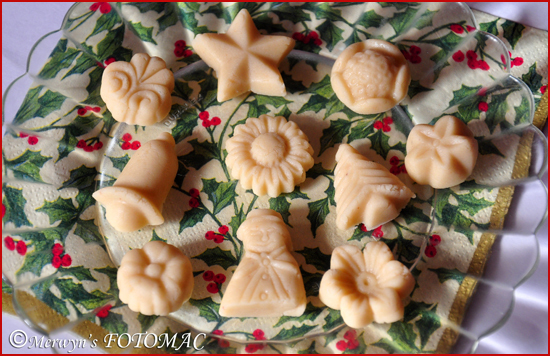 Have been making christmas sweets for years. But I guess yours looks white and mouth watering. I totally loved the shapes I have a couple of moulds but could never get the ones that you displayed can u tell me where can I get a similar type of mould. Can you make it in a ceramic utensil? The mixture just won’t thicken. I messed up the chocolate fudge too and am beginning to wonder f the utensil has anything to do with it.